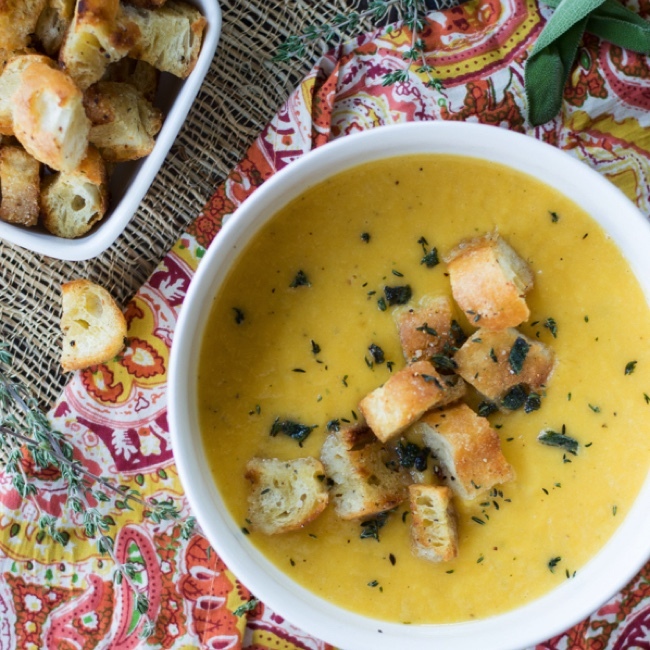 Warm up this fall with this simple butternut squash leek soup. It’s freezer friendly, full of flavor, and is taken to the next level with crispy garlic herb croutons. 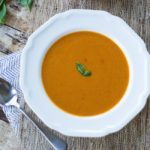 Serve this tasty soup on a chilly fall day or as an elegant starter to your Thanksgiving meal! Soup season has finally arrived. Although technically it’s been fall for a month now, it certainly didn’t feel like it around here. We’ve had lots of summer-like days, which I’m not complaining about because I’m a summer lover. 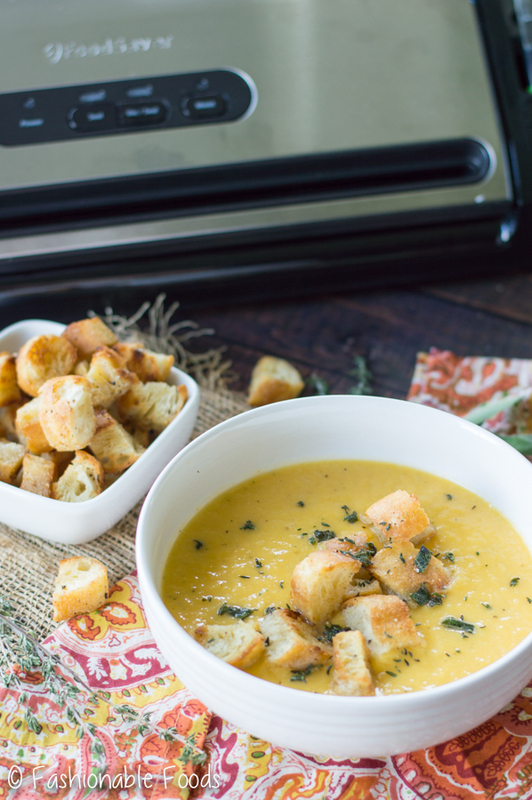 But, I also love a good crisp fall day because it makes for perfect soup weather. 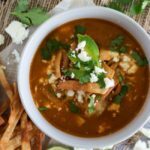 Don’t get me wrong, I’m a soup lover all year round, but some soups just taste better in the fall. 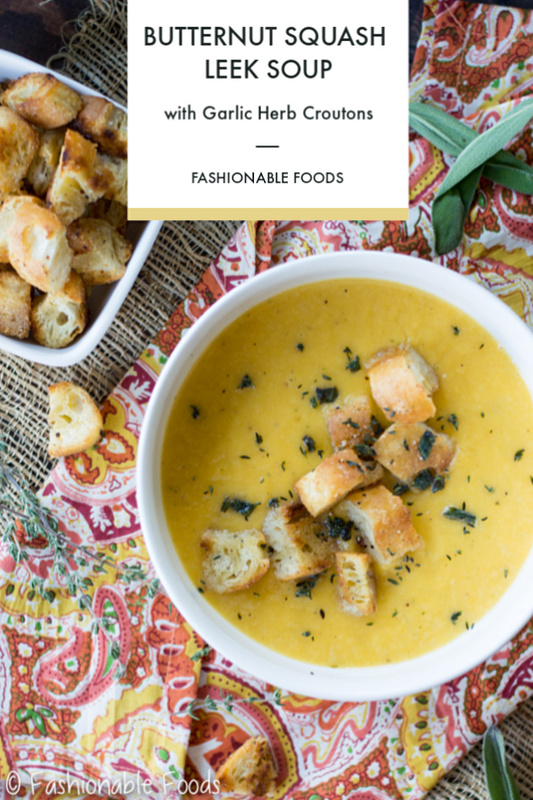 Like butternut squash leek soup with crispy garlic herb croutons. Doesn’t that just scream fall?! You can do a little ingredient prep ahead of time and freeze for later! Fall is such a busy time of year with back-to-school, numerous activities going on, and the holidays coming. 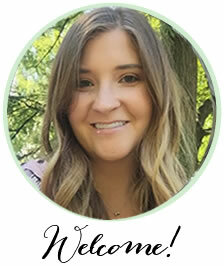 Luckily, I’m here to show you how to be fully prepared with the help of the FoodSaver® FM3941 Vacuum Sealing System, FoodSaver® Bags and Rolls Value Pack, and Costco. 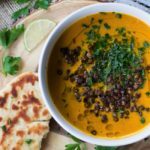 Not only will you have a delicious soup at the ready, but you’ll save time, money, and eliminate food waste! If you’ve been with me for a while, you already know how much I love Costco. It’s my go-to retailer all year round, but especially during the busy fall season and holidays. 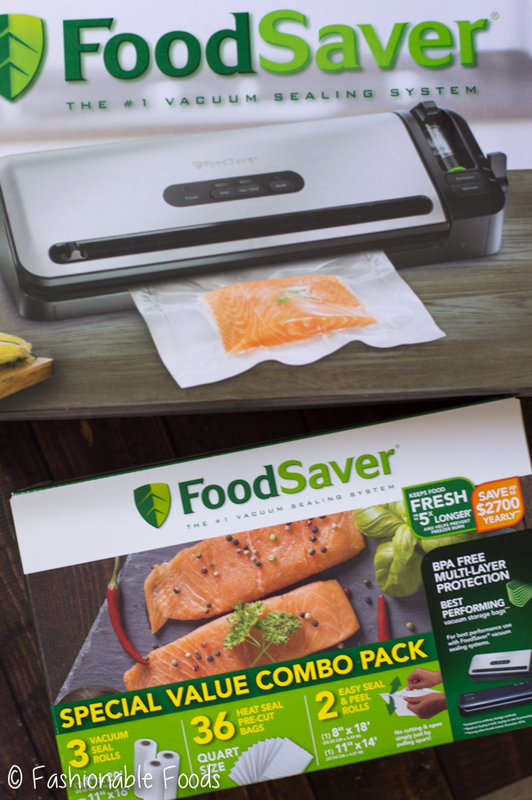 For the month of November the FoodSaver® FM3941 Vacuum Sealing System will be $40 OFF and the FoodSaver® Bags and Rolls Value Pack will be $10 OFF! You’ll need to have a Costco membership to take advantage of this amazing deal, but once you have it, you’ll quickly become obsessed. Buying in bulk is the best as long as you’re smart about it, which is where the FoodSaver® FM3941 comes in! FoodSaver® is the solution to save food because it keeps food fresh up to 5x longer than ordinary storage methods like zipper bags, foil, plastic wrap and containers. You’ll also save time because you can do things like marinate meat in minutes instead of hours, batch cook ahead of time, and do your meal planning in advance. You’ll be eliminating food waste while saving time and money! You can save up to $2,700 yearly with buying in bulk and buying on sale. System includes vacuum seal bags, vacuum zipper bags and containers designed to work together with vacuum sealers for optimal performance. We’ve all been in the situation where we end up with an abundance of food that we can’t eat before it spoils. 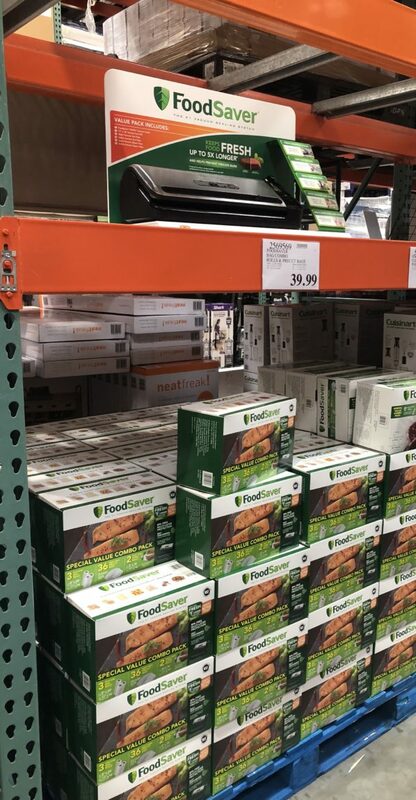 Whether you found a great deal, bought in bulk, or in my case had a garden full of butternut squash, the FoodSaver® FM3941 is the solution! I love utilizing my freezer to preserve food, but absolutely hate freezer burn. The FoodSaver® FM3941 has built-in features to easily preserve food in the freezer or refrigerator and making and cutting bags is easy with dedicated roll storage and a built-in cutter. 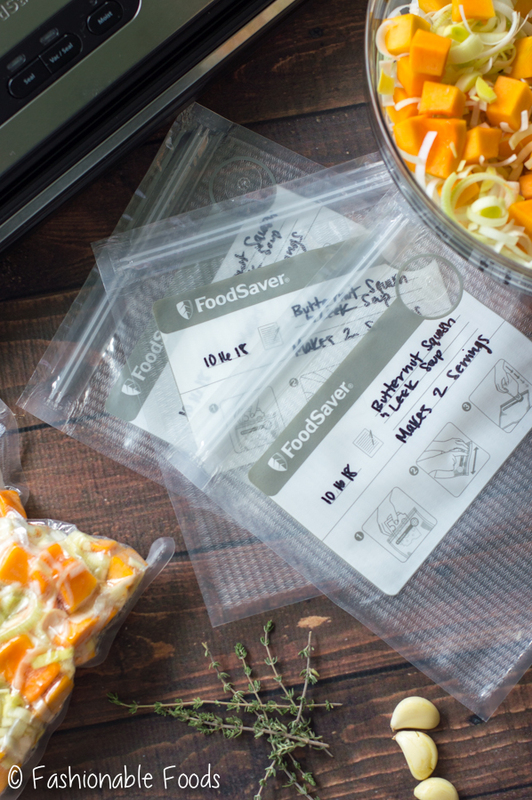 The FoodSaver® Bags are best for long-term freezer storage, blocking out air and helping to prevent freezer burn – making them perfect for preserving my soup ingredients! 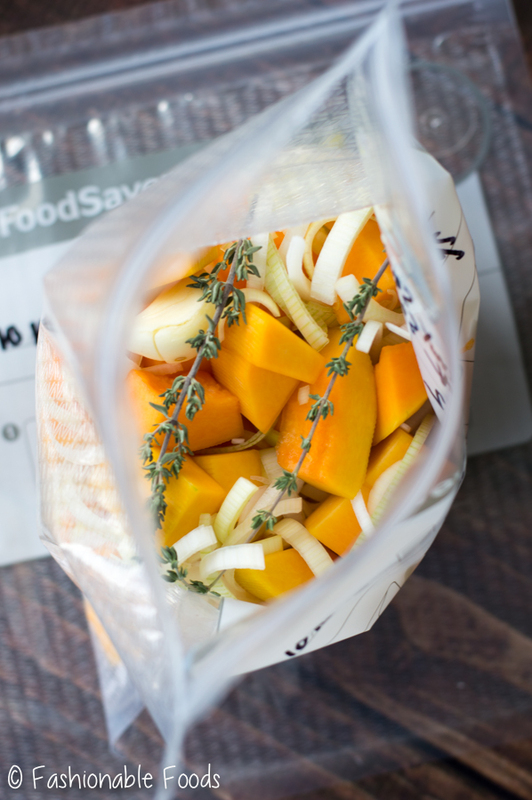 Using the FoodSaver® 1-quart zipper bags (label them first! ), fill each one with around 3 ½ cups of the vegetables. Then to each bag add in 2 sprigs of thyme and 1 clove of peeled garlic. Close each bag using the zipper closure and then lay them down making sure there are no ingredients in the way of the little circle in the upper right corner of each bag. Use the accessory tool (placing it flat on top of the circle) to vacuum seal each bag. Pop the bags in your freezer for making soup later! The recipe as written will serve 8, but I like to break it up into 4 bags that will each serve 2. This works best for me as it’s just my husband and I. However, you can also use the larger gallon zipper bags or simply make whatever size bag you need using the FoodSaver® rolls. Perhaps you want to serve this soup for Thanksgiving and you need 8 servings. In that case, you can just make a custom bag to hold all of the veggies for freezing until the day you’re ready to make the soup. When it’s soup making time you’ll just pull the veggies out of the freezer, open up the bag and dump ’em in a large soup pot after melting butter. Let them sauté a bit until they begin thawing and season well with salt and pepper. Pour in chicken broth and let it simmer until the butternut squash is very tender. Remove the thyme sprigs before pureeing to a velvety smooth soup. It’s really that easy! 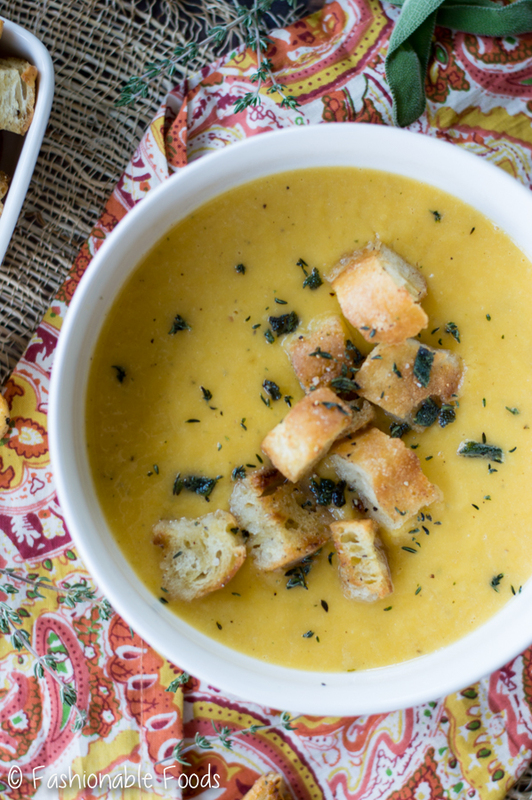 What really takes this soup to the next level is the crispy garlic herb croutons. You absolutely must make these! I know we’ve all grabbed a beautiful fresh baguette at the bakery only for it to go stale the next day. Not anymore! You can use the FoodSaver® FM3941 to preserve fresh bread. It’s incredibly easy to do and you’ll just love having fresh bread in your freezer at all times! Since we’re talking about food preservation today, I figured you’ll want to know the basics of using your new FoodSaver® FM3941! So, I’m going to show you step-by-step how I vacuum seal this fresh ciabatta baguette. First, you’ll want to cut your bread into desired pieces. I had a long baguette that I cut down into 4 pieces – each will make enough croutons for 2 servings of the soup. Once you cut the bread you’ll want to pop it in the freezer so it’s completely solid before vacuum sealing. 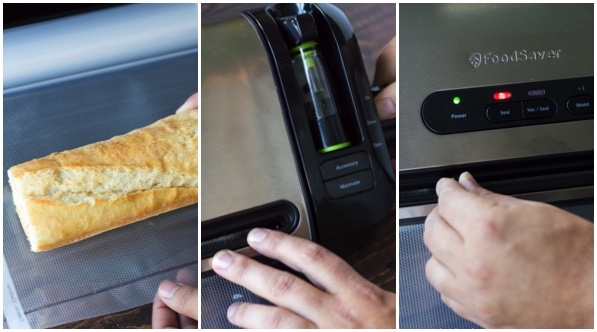 Breads have a lot of air throughout them, so if you skip this step and try to vacuum seal it, the power of the FoodSaver® is going to flatten your bread! Freezing it first makes all the difference. Open the FoodSaver® FM3941 and pull bag material down. We are making the first bag, so you just have to pull it down to the edge to make the first seal. Close the lid and turn the latch to the ON position while gently pressing down on the lid. 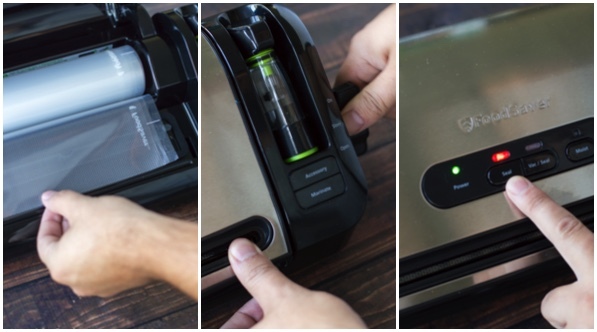 The power light will automatically light when the FoodSaver® FM3941 is in the on position. Press the seal button. You’ll see the red light come on and once it goes out, you can open the lid. Pull the bag to the desired length. I use the bread to measure – making sure to leave enough slack so that you’re able to fit the width of the bread and get a good seal. Close the lid and turn to the ON position. Now you’re ready to seal! Place the bread in the bag and place the open end of the bag in the vacuum channel. Close the lid and turn the latch to the ON position. Press the Vac/Seal button and watch the air get sucked out of the bag! After this happens, the seal light will come on to seal the bag. Once the light is out, you can open the lid and admire your preserved food! That’s all there is to it! 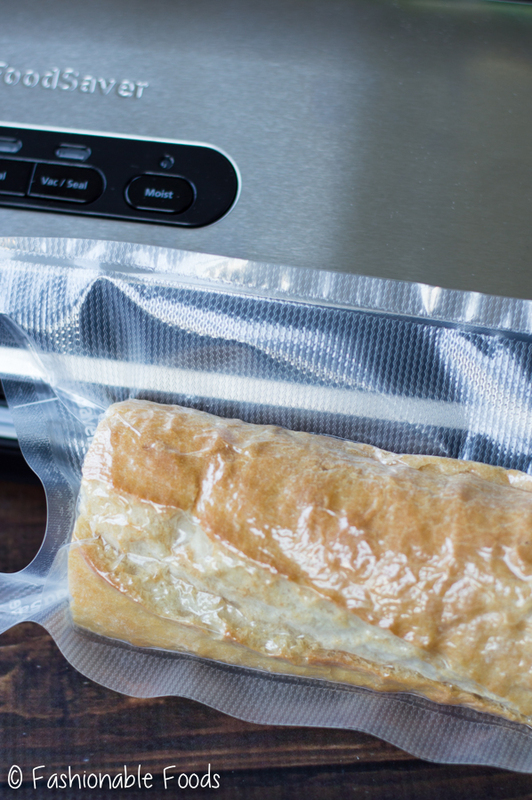 Once you get the hang of it, you’re going to love using the FoodSaver® FM3941 Vacuum Sealing System. It’s fun to use all while saving you time, money, and eliminating food waste. What more could you ask for? 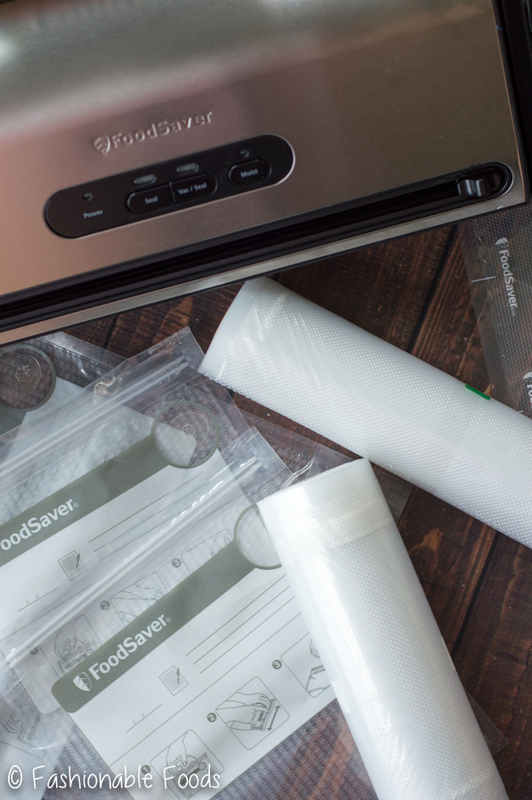 For more info on the FoodSaver® Vacuum Sealing System and FoodSaver® Bags and Rolls Value Pack be sure to check out the product pages here and here. You can also find FoodSaver® on Facebook and Instagram! Heat a large soup pot over medium high heat and add the butter. Once it’s melted, add in the leeks and whole garlic cloves. Sauté until fragrant, about 1 minute, and then stir in the butternut squash. Season the vegetable mixture with salt and pepper, add in the thyme, and then pour in the stock. Bring the soup to a boil and then reduce the heat to a low simmer. Simmer for 10-15 minutes, or until the butternut squash is very tender. Puree the soup using a blender, immersion blender, or food processor until smooth. While your soup is simmering, heat a large cast iron skillet over medium heat and add the olive oil and butter. Once the butter is melted, add the garlic, herbs, and cubed bread. Toss everything to coat in the fat and season well with salt and pepper. Reduce the heat to low and allow the bread to toast gently until crisp and golden brown. 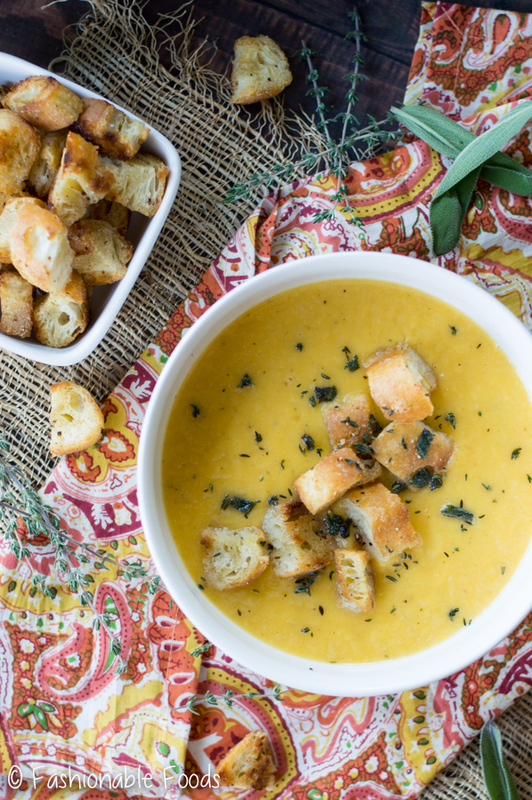 Serve the soup topped with the croutons and the crispy herbs. 1. Using the 1-quart zipper bags (label them first! ), divide the leeks and butternut squash equally among 4 bags. Add in 1 clove of garlic and 2 sprigs of thyme to each bag. Close each bag using the zip closure. 2. Using the accessory tool on the FoodSaver® FM3941, place it over the circle in the upper right corner of each bag. 3. 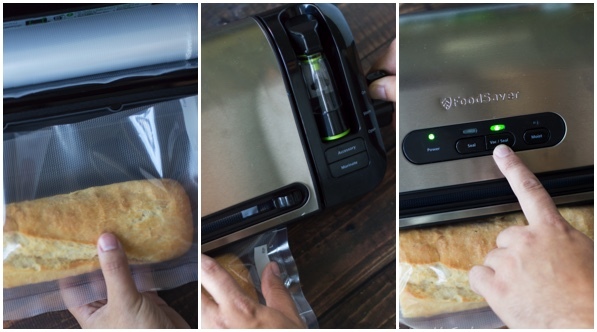 Press the Accessory Tool button to vacuum seal each bag. 4. Store the bags in the refrigerator for short-term or in the freezer for long-term storage. When you’re ready to make soup, melt the butter in a soup pot and pour in the veggies, herbs, and garlic from one FoodSaver® bag. Season well with salt and pepper, sauté a few minutes and then add in 2 cups of broth. Simmer the soup until the butternut squash is tender, then remove the thyme sprigs before pureeing the soup until smooth. 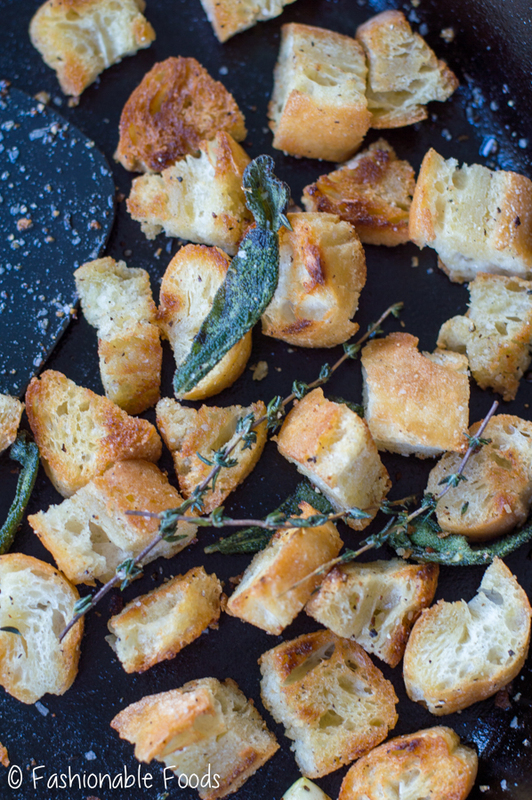 Don’t forget to top with the garlic herb croutons!